Have you ever dreamed of becoming the pope someday? Well, hang on there a second, dude, it's a slightly more complicated process than that to become the leader of the Catholic Church. You can't just fill out an application, staple your resume to it, mail it to the Vatican, and wait for a callback. 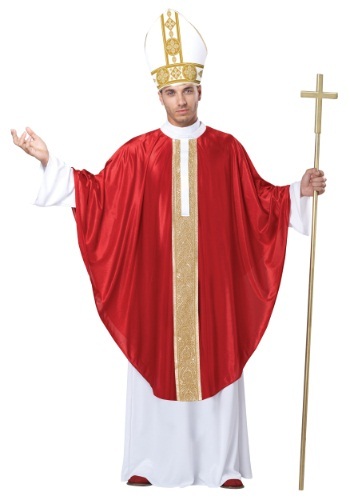 But when you're dressed in this Men's Pope Costume, at least you can have the same look as the pope! It obviously also takes way more than just a fancy costume to become pope, too. Since there is only just one pope at a time, and it's usually a lifelong position once someone gets it, there's generally a long wait time between popes. So, it's totally understandable when they want to pick the best padre for the job. But just think of the cool stuff you'd get to experience if you did get picked! People from around the world would travel to Vatican City to see where you lived, and your Christmas services would easily be the most popular around town. Whenever you were out visiting different countries, you'd get to sit back and enjoy a ride in the Popemobile, and if cruising around in a car named after you isn't cool, then we don't know what is! You'd also get to wear outfits just like this magnificent full length robe and cloak, made of shimmering gold trimmed fabric to give you a truly spiritual look. The real centerpiece of this costume is the tall, pointed, intricately detailed hat, which looks just like the hat worn by the actual pope. You may have a long way to go before you can be His Holiness, but for now you can practice your papal look in style!